It must have been the middle of the 60s decade—or was it the beginning? I don’t remember the year, only that the days were of intense spring. The festival of colours had ended just a few days ago. In those days, it used to take a long time to reach Santiniketan. There weren’t too many good trains, land prices in Santiniketan hadn’t started shooting up as yet, the rich of Kolkata hadn’t begun occupying Khoai to build houses. By the time we reached the place, the afternoon had nearly slipped away. Just before Cinematola, there used to be a country liquor shop called Akorshoni; Shakti stopped the rickshaw there and grabbed a couple of bottles. I entered the house. The famous house that has been described by so many. The signs of poverty were everywhere. On one side was a string cot with dull, faded bedding. On top of the bedposts lay a folded, dirty, almost blackened mosquito net. A few painted canvases lay above the net. We learned that it had rained a few nights ago and water was leaking through a hole on the roof. An irritated Ramkinkar had woken up; put a few canvases atop the mosquito net and gone back to sleep. If water had to drip, it would fall on the canvases. It was almost three in the afternoon. He never asked if we had any lunch or not; food arrangements meant that pork meat, if available. He poured the liquor into the tumblers with great care and presented them to us in a manner befitting a Japanese tea ceremony host. The pork came and vanished; a rickshaw-puller was made to bring two more bottles, along with some roasted chickpeas; those were gobbled up in no time. Two more were brought by paying a premium—it was past ten in the night. I don’t remember anything after that. I just remember endless country liquor, endless bidi smoke, endless talk, endless songs of Tagore, sung in broken voices. I don’t know what time of the night it was when my consciousness returned, triggered by severe thirst. The early summer heat of Santiniketan’s Chaitra, coupled with limitless tumblers of undiluted country liquor might have been nothing unusual for Kinkarda and Shakti. I was sheer lucky not to have suffered dehydration. For a while, I kept sitting quietly. It was pitch dark and the place unfamiliar to me. I extended my hand and felt Shakti, sleeping unconsciously beside me. I couldn’t spot Kinkarda. But it seemed as if my life would ebb away without water—the body was so dry. Where could I find some water? While still sitting I felt the darkness melting away a bit. How did that happen? Was dawn approaching? I turned back and figured a light in the shape of a small rectangular door—a lantern must have been lit somewhere inside. Could I find water there? As I started getting up, extreme dizziness gripped me—it was impossible to stand. I sat down. The moment I moved a bit, the unknown world around me started swaying. But I had to drink some water. After a while, I gathered enough strength to crawl towards the door. The door led to a verandah; on the left, with his back to the door, at approximately a thirty-degree angle sat Kinkarda on a stool, stark naked. He hadn’t noticed his lungi slip off his waist. Before him, on a high stool (I don’t remember if it was a turntable or not) stood an unfinished clay sculpture; the lantern was hung on a bamboo support fixed to the ceiling. His right hand held a small fistful of clay. Sitting on the stool, Ramkinkar stared at his work—motionless. A million mosquitoes were clouding around him, but he didn’t seem to notice. His eyes had a strange, blank expression—he looked on, but didn’t seem to see with his physical eyes. It was more of what Ramakrishna had called a yogi’s eyes—he had said that when a bird sits on her eggs, the look in her eyes suggests that she was looking, but not really seeing anything; all her focus remains concentrated on her eggs. Ramkinkar had the same look in his eyes. Even in my semi-conscious state I realized I had trespassed. I had no business there; even if I died of thirst, this wasn’t a place to ask Ramkinkar for water. And even if I did, he wouldn’t be able to offer me any. I crawled back to the room and lay down with my parched throat. 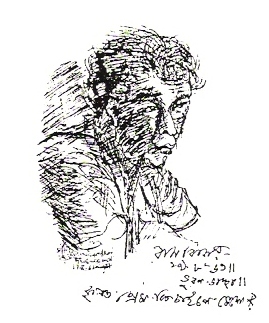 Translated from Amar Bondhu Shakti (আমার বন্ধু শক্তি) by Samir Sengupta; published published by Parampara, Kolkata in 2011. After a recent trip to Kolkata where I deliberately spent as much time as I could, immersed in Shakkti Chattopadhyay’s poetry and meeting his family several times, this post brought tears to my eyes. How lucky in a sense both Ramkinkar and Shakti have been to have escaped this day, where both the world outside Birbhum and the commercialisation of the surrounds of Santiniketan would have horrified them. Thank you for this!